Philippine Industries. Where are the jobs? Filipinos want to work but the jobs aren’t there. What’s to be done? This article is a bit of a diary. I’m writing as I discover things, so pardon me if there is a shift in direction here or there. . . It seems to me that to develop a model for job growth in the Philippines, it would be wise to identify the industries that are job rich and under-performing, like tourism and agribusiness. Or we can look at products where manufacturing can establish the core business around which a huge framework of supporting industries can grow, like finance, construction, technology and trade. Take boat-building as an example. The Philippine labor-cost advantage will fade as the nation becomes richer and more competitive. Industries such as call centers or electronics manufacturing will become vulnerable in a rising, richer, competitive nation. How can we find more jobs? It struck me that a sizable industry in the Philippines that is not recognized as an industry is “entertainment”. It is one of those jazzy, soft industries of color and show, not unlike tourism I suppose. I am always impressed by the number and quality of entertainment shows produced professionally pretty much on the fly, or the music competitions or beauty contests or arts or movies (who is the modern Fernando Poe character, I wonder). I also categorize magazines and newspapers as “entertainment” because there is not much in-depth news there. And sports, of course, led by Representative Pacquiao. So the question arose, cannot the entertainment business be leveraged better for global markets? To create a lot MORE jobs? Is it substantial enough as an industry? I was surprised that the Philippines is the fourth largest ship-building nation in the world and that the work pool is drawn from the nation’s 60,000 certified welders. Aerospace and Electronics involve primarily the production of parts for overseas companies. Next, I went to NEDA, the National Economic and Development Authority. This agency is always perplexing to me. Such an important function, but NEDA produces so much detail that it buries synthesis and profound reasoning under mind-boggling words and charts. I can never see the forest for the number of trees NEDA’s publications keep throwing in my face. Surprisingly, the National Development Plan does not have an industry focus other than featuring Agriculture and Fisheries Industry for special attention. How can you generate jobs without considering the condition of the various industries? Here is the link to the National Development Plan Results Matrix provided on NEDA’s web site. Lots of luck. Agriculture: 10.4 million jobs and shrinking. Retail/Wholesale Trade: 7.1 million jobs and growing. Manufacturing: 3.2 million jobs with little growth. Transportation: 2.2 million with some growth. Defense: 2.0 million and steady. Construction: 2.4 million and growing. Other Services: 2.2 million with some growth. Hotels/Restaurants: 1.6 million and some growth. Fishing: 1.4 million and shrinking. Education: 1.2 million and some growth. Mining was surprisingly low to me, at only 250,000, and the “entertainment” industry logged in at a rather puny 346,000 (excluding newspapers but adding in some tourism attractions). None of the industries showed dynamic growth. Strongest growth areas are retail/wholesale trade and construction. They are cyclical, the former dependent on consumer buying tendencies, the latter on investment. Clearly, an annual increase of 317,000 jobs on an employment base of 38 million jobs is not going to improve the job picture fast enough. Furthermore, in a deeper, more vibrant economy, we’re likely to see an acceleration of the trends shown in the table, with agribusiness employment down due to more efficient farming, and jobs shifting to the packaging and selling of products. Very clearly, my hypothesis that entertainment could be a jobs machine was proved highly unlikely. The base is small. It is just a highly visible industry without a lot of depth. Trendy ideas like “medical tourism” (e.g.,foreign residents coming to Subic for low-cost medical care) are not likely to add much. That leads to the question, and I convey it to readers, how does the Philippines generate more jobs? End the cooperative framework for farming and replace it with competitive corporate agribusiness. Pass a Fair Employment Law. Make sure there are career tracks available to get rid of hiring and promoting for favor. Build skills into the corporate sector. With that, more globally competitive enterprises will emerge, and more jobs. Pass anti-trust laws that create genuine competition rather than today’s “gamed” market that has banks basically colluding on interest rates rather than market forces driving them, and which allow the giant food packaging companies to set agricultural product prices to farmers very low, and other anti-competitive practices. More competition, more vibrant investment in technology and productivity, better efficiency, more jobs. Build a self-contained military-industrial complex so that every ship and missile, and every bullet fired in training, is made in the Philippines. And Kevlar helmets, too, thank you kindly Ms. Napoles. If Coors Beer could make porcelain based flack vests for American soldiers (they did; my mother made the porcelain parts), San Miguel can do the same. It makes so little sense to me that we are paying American wage scale when we buy military ships when we could build them in the Philippines, pay less, and employ thousands. So I think if the Philippines is serious about defense, it will invest in it big time. Some fast bullet point thoughts on a great and most important subject. 1. I’m missing the 11 million OFW’s in the equation. 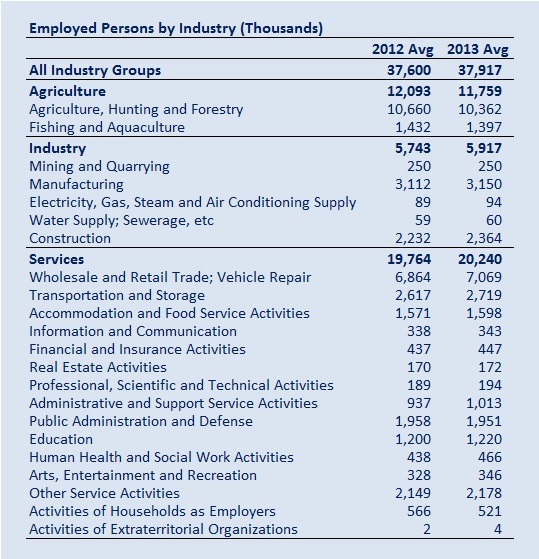 Also the underemployment is not mentioned, the redundant cashiers for redundant checks in the department stores, inefficient distribution via Sari-sari’s, inefficient transport via the too little tricycles, …. 2. Job creation and enablers/barriers. 3.3. Holistic approach: able workers- TESDA, infrastructure, tax incentives…. 4.1. Software development. Why shouldn’t the next Facebook or Flappy Bird be a Filipino invention? Or smartphone e-bike integration app? 4.2. Call centers. Language and voice capabilities of computers are rising fast too, traditional call centers might become the next saddle industry of the late 1800’s needing new markets as horse riding will get in decline. 4.3. Furniture. Cebu has world class manufacturers, Philippines as the new design center, bye-bye Milan? 4.4. Agribusiness as long as it is diversified and not part of the global mastodons monopolizing knowledge and innovation. 4.5. Why buy American ships? You can get them at scrap prices, only the new steel for local production is more expensive. This might be an interesting book for our legislators. The Philippines is not the US, but a lot of economic mechanism might be the same. Excellent check-list, and I enjoyed reading the link in your second comment. I like the “cluster” concept of job origination and multiplication. That is why your 4.3 rings strikingly true as the possible best way forward. Cebu, furniture. Cagayan de Oro and General Santos City, boats. Biliran, citronella products (we have a way to go yet; or “electricity” for export to other regions). Bukidnon, beef, coffee, whatever. Philippine coffees are the best. Put some government money behind development of these product hubs, and if the multiplication is true, 5 indirect jobs for each direct job . . . we are making real progress. In terms of big policy steps, when they re-write the constitution, they should yank the cooperative form of agriculture production, and number two is an anti-trust law that breaks the food cartels holding prices to farmers so low. If OFW’s are included as an “industry”, it is the largest industry, and growing. But I sort of get the feeling that the Philippines is losing a lot by promoting this industry. Under-employment is probably about 50 percent of the laboring work force. Most jobs hereabouts are day-labor, no benefits, maybe P200 a day, to P450 for more skilled people. Tricycles are everywhere because that is the way the construction workers put food on the table during the many down cycles. I rather like the tricycles in my town, quick P5 ride anywhere downtown. The under-employed are the problem; jobs are the solution. OFW contribution to our economy & job creation is evident in TRADE (wholesale/retail). OFW remains to be the blood vessels of the MALLS and medium prices Condominiums. So very true. The Philippines is a global nation. Ahahahaha, I’m just a data glutton . . . . and the web information is getting much better these days. Four years ago it was maybe 15% good and 85% slop, and today I’d put it at 60/40. Interesting point regarding my inquiry into “Entertainment” as an industry, as mentioned in this post. Senator Angara today introduced a bill aimed at encouraging “film tourism”, or using the Philippines for film production sites. 1. I don’t have the official statistics but my personal impression is that work force productivity has a lot of room for improvement. The Philippine Labor Code, I feel, has been a drag and needs to be modernized particularly in the context of rapid economic globalization. 2. Small and medium scale businesses must be provided access to financing. Again, I do not have the official statistics but it seems clear that unsecured or partially secured business loans (with reasonable interest rates) for small and medium scale businesses are practically non existent. 3. Small and medium scale businesses must be provided technology assistance in order to be globally competitive. Example: Philippine fisheries is beyond outmoded. 4. Cartelization among giant PH companies is rampant. Examples: Animal Feeds,Hardware and Construction Supplies (Steel, Cement, Electrical, etc), Shipping, Fertilizer, Transportation, Banking, Insurance, Textile, Plastics, Packaging Materials, etc. We can simply compare ourselves with our neighbors (Thailand, Vietnam, Indonesia, and Malaysia) to get a good sense of which areas we are being left behind. Four very practical steps to improve the business climate to one that is competitive, vibrant, and likely to provide a lot more jobs. I particularly like the suggestion of 2, 3 and 4 combined which argue for the energizing of small (not just micro) and mid-sized businesses. Financing must be available to make that happen, but also the ability to establish a track record for those who apply for loans, and trustworthy sources of repayment of the loan. In American banking, there usually must be three sources of repayment, for example: (1) from business profits, (2) from the owners’s guarantee and sufficient personal assets to back the loan, or (3) sale of business assets. So there not only have to be lending programs, but there needs to be education and processes that are understood and agreed to by the borrowers. Very strong analysis. Some of my observations the last 10 years. Many employees have 12hrs or 14hrs working days, productivity in such long days is impossible. Supervisors hand out overtime as “fringe benefits”, overtime is a must for most workers to survive. The benefits of increased efficiency never goes to the employees. Many organizations are too vertical, too many layers, too autocratic – decisions at the highest possible level, not at the lowest possible level. Many are undercapitalized, no proper tools, slowed down while waiting for some cash from another ongoing job to buy supplies. Many think negative, how to increase entrance barriers, they have little trust in competitors, little cooperation to develop markets. Many cooperatives are driven from above, by civil servants and NGO’s not by its members. Little pressure from consumer associations, unions, farmer associations and the like to challenge the status quo. Coffee is one of the products that I envisioned then to be a major export of this country which will redound to added employment and at the same time, could be of tremendous help in growing more fruit and hardwood trees because coffee grows and bears more fruit under the shades of other trees. The Sierra Madre mountains was deforested by the Land Reform law during the term of President Ramon Magsaysay due to influential people who were able to get titles to their 24 hectare homesteads and used them as collateral for bank loans they did not bother to pay. Narra and other valuable hardwood trees were felled and sold because the agreement was for them to replace them with fruit tress which they did not comply with. Then the kaingineros and the charcoal makers came along to harvest new growths so the denudation was complete. That is why I was very much against the construction of the skyway because of the costs it will entail but would not be of much use in decongesting traffic in Metro Manila because not too many motorists would be willing to pay toll fees beyond their capacity to pay. The money intended for that project should have gone to a more promising undertaking like what I stated above wherein added employment for squatters in the metropolis that must be relocated would be the primary enticement for them to abandon their way of life and embark on something new which could change their lives and that of their children. I stated in one of my comments in one of your blogs then that coffee grows best in highlands. The Cordillera mountains had long been planted to all varieties of coffee, particularly the arabica which is number one in the world market, but not of the quantity that could generate huge income from exports and we all know that coffee will remain a favorite drink for all people for all generations to come. In between hardwoods and fruit tress like avocado and mango, they thrive best. And much better when banana plants are inserted for more moisture during summer months. And cacao could be added for more income because they are like coffee that bears more fruit when grown in shady areas. The investment would not take long to recover because the waiting for the first harvest takes only two years. And we could not expect for more employment at a faster pace than this plan which will not require higher education or any other skills needed for manufacturing and other jobs you enumerated above. We herein appoint you the Society’s Chief Coffee Officer. You have confirmed what I think ought to be the model for jobs. Get private parties and favor and even cooperatives out of the picture, put in middle-sized corporate farming initiatives, provide government support for international umbrella marketing (as is being done now with tourism), and ramp the business up. Hell, get Jollibee to set up a subsidiary coffee shop chain in the US and take on Starbucks. Philippine coffee can compete. No question. Economics, they say, is pretty much a simple and straightforward discipline. Any free, independent, and sovereign country could adopt economic policies which would maximize its resources, productivity, employment, and price stability, all geared, supposedly, for the general well being of its citizens. That is, if we are living in an ideal, conflict-free part of the world. And because we are obviously not anywhere near that egalitarian or utopian state – when economics met politics – that is where it gets a little complicated and, oftentimes, nasty and tragic for the millions of souls who would directly suffer the consequences of wrongheaded policies. That is why, while JoeAm’s post for today has excellent, practical, and doable policy suggestions, the question is : who is listening? Are our lawmakers and policy makers listening? Will the different vested interests and economic players give it a try? Will the initiative be primarily from the private or the gov’t sector? Looking at the NEDA link alone will get you discouraged and frustrated, if not angry, because it is full of crappy techno speak and very little, if any, policy vision that would dramatically change the country’s laggard status. Unless and until the country could evolve sufficiently enough to produce competent and visionary set of leaders, we could probably offer a thousand and one brilliant suggestions here and it wouldn’t matter a single bit. Excuse the cynicism Joe but you may have chosen to live and retire in a country that’s fit to occupy the lower rung of Dante’s inferno in some area and a heavenly nirvana on the other. Caveat: Evolution, both social and biological, moves ever so slowly. If we want to speed up the social aspect of it, we need put an R out front. Ah, well, Micha, we all have to hang our hats somewhere, and an interesting, conflicted place is better than what my brother is doing in the U.S., which is mainly whacking a little white ball with a stick and trying to catch fish in this river or that between beer breaks and snoozing. Thank you for confirming my impression of NEDA. You know, I know important people read some of these blogs, but cannot comment for obvious reasons. I think some of the ideas work their way into policy. The step beyond blogging, and the pushing done here, is an advocacy program. Frankly, that is beyond me as it would entail a commitment I can’t make, so my highest and best use is words that push. Readers can help immensely by pushing, too, putting out links to particularly insightful blogs. If enough of that is done, perhaps action will follow enlightenment. Revolution to me would be too destructive, a step back to the age of coups. I’d rather have a good set of presidents for the next 12 years, working steadily toward better policies and programs. But it need not be violent Joe. Revolutionary policy changes can be accomplished without having to take up arms. I would, for example, consider the recent passage of RH bill as revolutionary. Anything that would undermine the influence of Catholic bullsh*t in the country is good for the country and thus, revolutionary. The prospect of sending Enrile, Estrada, and Revilla to jail will be quite revolutionary too. So yes, we’ve been making significant revolutionary progress in some aspect of our national life but it’s in the area of economic policy that is frustrating. We have been designated as a Newly Industrialized Country (NIC) since, I think, 1990’s but where is the industry? The shipbuilding in Subic and Batangas of which we were ranked 4th in the world turns out to be owned and anchored by South Korean and Japanese companies. The chip making industry in Baguio is owned by Texas Instruments. The car assembly plants in Laguna are subsidiaries of Nissan, Ford, Toyota and other foreign companies where they have full control of patent, know-how, and revenue. We have the resources, capable manpower, and knowledge can be reinforced and acquired – why in the world can we not have a fully owned competitive industry? Why is NEDA brandishing instead the coconut, banana, pineapple, and cauliflower production? Yes, agriculture is an important component of the economy and it should be maintained and improved (because even there we are mediocre) but we cannot hope to improve our economic prospects if we cannot anchor it on technological and advanced industrial ground. Did South Korea achieved its first world status by sticking to ginseng production? NEDA + bananas = banana republic. Now THAT kind of revolution, which features big bold moves rather than the incessant little efforts to squeeze more blood out our under-nourished kamote, I wholeheartedly endorse and sign onto. Find a presidential candidate who can speak in terms of bold but necessary restructuring instead of mother and guava pie statements about poverty and jobs, that’s whose train I’d climb aboard. Anti trust law. Fair employment law. New banking law to break the collusion on rates and inject competition. New processes for business borrowing and lending bringing discipline to both borrowers and lenders to get past the existing model of lending to friends. PPP for ship building. PPP for military gear. PPP for credit rating agency (consumer loans). What garb are revolutionaries wearing these days? Crunching your numbers together with the OFWs, we’ll have around 54 million jobs available to Filipinos. My past research turned 40-50 million available manpower yearly. Looks like there should be an employment surplus instead of deficit. In the same vein, it looks like if the government focus on improving the existing industries, there should be more than enough jobs for all. What is clearly missing is funding and push for research and development of these industries. Innovation is needed in order to produce better (new and Improved) products from existing industries and discovering/inventing new ones. Philippines is endowed with bountiful natural resources. Instead of selling the raw materials, R&D, infrastructure, plus human resources investments will go a long way in realizing full employment. There is an energy crunch there and people are complaining about the price of utilities. What about industries in alternative energy and fuels? What about studying solar, water and wind power to be tailored to PI’s need? What I see in US is the national government’s blessing for governors and mayors to look for industries that they want in their own backyard. Then before the industry comes in, the local government partners with community colleges and universities to churn out human resources certified to work in the industry. It is a win-win situation. That’s an interesting calculation, 54 million jobs. I wonder how the jobs are tabulated. If you took agribusiness, does the day worker get tallied? To me a “job” ought to be something with a career attached to it, and benefits like SS and health insurance. The tricycle drivers who are the lowest scale, subsistence workers, would not count in the “job” total. There are a lot of weed-whacking teams cleaning up alongside the road. They are most likely government employees. Do they have benefits? what are they paid? I suppose we’d need to dig into how Labor calculates those numbers. A “job” to me should pay at least P8,000 a month, which kicks off millions of P2,000 domestic and farm workers. Very clearly, more money needs to get into the pockets of workers instead of the rich. 1. I was going to skip this one. This is not my area. Joseph has put things in perspective. 2. Just a few remarks comparing the Philippines to Australia, a first-world country. 2.1.1. It is said that the world is shifting from a manufacturing economy to a service economy. This is mirrored above. Of the types of services considered as part of the service economy – financial services, hospitality, retail, health, human services, information technology and education – only information technology is missing from the top ten. This is ranked at No. 16. 2.2.1. The Health Care and Social Assistance sector at No. 2 is ranked No.13 for the Philippines. So ratio-wise, Australia has more doctors, nurses, paramedics, aged and disabled care workers and ambulance officers. Additionally, it is a semi-welfare state that provides a social safety net and has an extensive public medical care program. 2.2.2. The Professional, Scientific and Technical Services sector at No.6 is ranked No. 18 for the Philippines. This covers market and scientific research, engineering, architecture, law, accountancy, advertising, management consultancy, veterinary science and professional photography. Australians have many pets and consequently have many vets. So little research and innovation in the Philippines which underscores Micha’s point about pervasive unoriginiality? 2.2.3. The Financial and Insurance Services sector at No. 10 is ranked No. 14 for the Philippines. In Australia, financial advisers are as necessary to economic health as doctors are to physical/mental health. I have one (to manage my personal retirement fund), and I certainly cannot be classified as well-to-do. Cars carry insurance cover, but in the Philippines are homes insured against fire, winds and floods? 2.3. Conversely, there are two Philippine sectors that are not in the Australian top ten. 2.3.1. The Agriculture and Forestry sector is the Philippines’ No. 1 and accounts for a whopping 27.33% of all employment. This sector is ranked only 14th in Australia and accounts for a measly 2.5% of employment. So the Philippines is very much a pre-industrial, labor-intensive society and Australian agriculture is very much mechanized. 2.3.2. Fishing is a separate sector for the Philippines and is ranked No. 9. For Australia, Fishing is included in the Agriculture and Forestry sector. 2.4. Surprisingly, Manufacturing is No. 3 for both countries. Australia’s car-manufacturing industry is dying. The country is resource rich, and exports livestock and ore. Mining at No. 16 is heavily mechanized. 2.4.1. The Hotels/Restaurants sector are similarly ranked at No. 8. 2.5.1. Education is No. 5 for Australia but No. 10 for the Philippines. This probably means that Australia puts a high priority on education and not that Australians are more in need of education. 2.5.2. Transportation is No. 9 for Australia but No. 4 for the Philippines. This is airlines, railroads, trucking and storage. Surely, this must include shipping for the Philippines. 2.6.2. Note that Australia looks askance at foreign workers because of the threat to young people entering the work force. 2.7. Education must be geared to finding out what young people want to do when they grow up. Government must suss out trend and advise schools and parents on what jobs are likely to be in demand in the future both here and abroad. There has been an oversupply of teachers and nurses? 2.8. 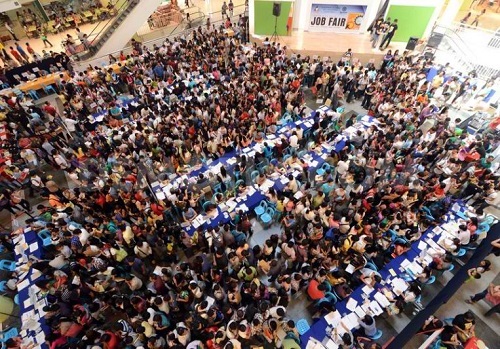 Lateral thinking suggestion: The Philippines should decrease the production of potential job seekers. Aka babies. That is a very instructive comparison. I’m glad you did not skip it. The differences have two meanings to me: (1) that Australia has a more mature and competitive business climate, whereas the Philippines is rustic and oligarchic. (2) there are some clear ideas here about where jobs should come easily with the right government-supplied framework: finance, health care and professional services. With regard to the latter, the low personal income levels in the Philippines constrain opportunities. So many doctors are simple pill doctors, handling large masses of people who can’t really afford more care than P250 for the visit and a prescription. But there are steps that can be taken, as suggested in this thread – lending programs for small and middle-sized businesses, for instance. Insurance. That is rather like a discretionary purchase and most people here generally don’t have that much discretion. Correction: they don’t have enough money to have the discretion. The biggest barrier to develop vibrant manufacturing industries in the country is the high cost of power due to the prevailing oligopoly in the power industry. power cost 2-4 times higher than in other southeast asian and developing countries, and when energy costs figure 50-70% of inputs to production, a single peso increase in kwh translates to millions/billions when manufacturing is done in economies of scale. In addtion, one of the biggest mistake in our policy is letting companies ship out our raw mineral ores, instead of having them processed here for accessibility to other upstream manufacturing industries. Just last year, Indonesia made a policy forbidding the shipment of raw minerals out of indonesia. Bingo. Bingo. You make the point that there needs to be an “infrastructure” for jobs, with cheaper electricity among them. It is crazy to me, as I see all the water crashing down the mountain here on Biliran, that no one is tapping this wasted energy. There finally is a geo-thermal plant going in across the island, but the rumor is that the permitting required huge payments to provincial government agencies, which will then burden electricity coming from that source forever in high cost of building the plant. So development of a better infrastructure means removing short-term thinking on fees (and bribes) so that the long term economic base for electricity is competitive and not burdened. So two points of note to myself: (1) infrastructure for jobs (electricity), and (2) losing the short-term quick-hit gain in favor of long term competitiveness; a kind of intellectual infrastructure. I wholeheartedly agree with your view on mining. These are cherished, irreplaceable stones. The Philippines is selling them for 1% of value to China and Korea. Dumb. The Philippines being an archipelago, it quite ironic that we our shipbuilding industry is undeveloped. Most of our shipbuilders are in EcoZones building ships for korean or european companies. Yep. The Philippines is missing the boat. Guess when and who wrote this????? Okay, out onto the tree limb I cautiously creep, observing Rhiro with saw in hand . . . Adam Smith? But what is interesting is trying to figure out which empowers the Philippines, its agriculture or its great city and foreign trade. It is like a barbell with no middle of manufacturing. Or the manufacturing that does exist is for foreign trade, so I guess the Philippines is rather “unnatural”. 1. Written in 1776. Remarkable. Prescient. Or remarkably prescient. But a bit dated. 1.1. “Foreign commerce” refers to foreign trade but does not embrace globalization. 1.2. The folly of urbanization may not be folly. 1.2.1. Urbanization in the “more developed regions” is between 70 – 80%. 1.2.2. Urbanization in the “less developed regions” is below 50%. 1.3. While agriculture contributes more than 25% of GDP for many less developed countries, it contributes merely 3% to global economy. 1.3.1. For the Philippines, it’s 12%; China 10%; Vietnam 20%. 1.4. Does not foresee the service economy. 1.5. The “natural order/course of things” is questionable. It has been said that the Philippines has missed the manufacturing stage and is going from an agriculture to a service economy. 1.5 Rather like jumping from shouting to the cell phone without those clumsy telephones with a wire sticking out of them. Although I would note that, if my neighbor is any example, or my wife now and then, shouting is still in vogue. 1. Thank you… I think. 2. Yes, I am lost. 3. Generally, men who are found are closed or have closed minds. 3.1. They have found religion. They have found God. 3.2. R.Hiro, for example, is a found man. It seems his religion is economics. His God Adam Smith. And the devil Karl Marx? 3.3. In fairness, I see that Adam Smith’s ideas need re-engineering. 4. If we examine economics against the backdrop of Maslow’s Hierarchy of Needs, we find that economics is primary. Economics plays a primary role in satisfying the two lower levels of the hierarchy, namely, the physiological and safety needs. 4.1. In this sense, economics, being the base of the pyramid, is the ground upon which all else becomes possible… at least, in terms of human existence. 4.2. So, repeat, economics is primary and basal. It is of primary importance. 4.3. In the context on this essay on jobs, therefore, it is perhaps right that Adam Smith attains the status of God and his ideas that of religion. And R.Hiro the status of right-hand disciple. 5. But…. but before I discuss the but, let me make another point. 6. Man does not live alone. He lives with other men. And each man, all of us, are interdependent upon each other. Again, at the lowest level of this interdependence, the exchange of goods and services resulting from man’s labor – or, in a word, economics – is primary. 7. But – and here is the real but – but does man live for consumption alone? 7.1. Economics is the answer to man’s subsistence. But is economics the answer to his higher needs in the Hierarchy – that of love and belonging, of esteem and self-actualization? 8. Religions other than that of R.Hiro’s have attempted to provide the answer to these higher needs. 8.1. Many men have accepted these answers and continue to do so. 8.2. But in a sense all of these religions have failed because none is universally accepted. 8.3. Therefore, in this sense, all men are lost. 9. In effect – and we come to one of those paradoxes that I am so fond of – those who are found are lost. 9.1 … And I am not alone! 10. Here we arrive at the crux of the matter. The question arises: What is the difference between their lostness and mine? 11. The answer, I think, lies in the fact that there are two modes of existence. One can accept a religion and believe, like R.Hiro, that one has all the answers. Or one can accept no religion, accept only those answers that one knows to be true, and live in the awareness that there are more questions than answers. 11.2. And it is true that the second mode of existence is one of vulnerability. It is an admission of ignorance, of consciously not knowing, of knowing one does not know. At the same time, it is one of innocence, which is a kind of grace, and it is one of openness to the universe and all its wonders. 11.3. Needless to say, I choose the second mode. …Thank you for real. I enjoyed writing this riposte. Oh, I forgot. I was so enamored of the word “lost” that I forgot. My main point was that the economic paradigm(s) of Adam Smith no longer holds water. There is wisdom in the past, but that wisdom may also be of the past. Please note that the sectoral division of labor means that the farmer grows the paddy rice but the rice mill mills the rice in the manufacturing sector with the services sector providing the transportation, warehousing, wholesaling, retailing and credits. But if the primary sector is underdeveloped and mal-developed then the farming sector is like a round peg in square hole. That will affect supply and costs will be high and this will affect the cost of food for the urban workers. Hence he will need higher wages to compensate for high food costs. Countries similarly situated that have far more efficient farming sectors would automatically have lower wage rates than the Philippines. Packaging is also manufacturing? I think that is an area of great opportunity for the Philippines to replace the jobs that mechanization and larger farm plots would cost in a more industrialized Philippines. Grow the citronella grass and convert it to oils then put it in candles. The Philippines does the growing and the oil producing, but not the candles. Re. the last paragraph, I presume lower wage rates from mechanization in farming would be offset to some extent if cartels were broken up by anti-trust to allow more profit to flow down to the farmers, and by shifting workers to packaging and transporting. Who wrote this and when did he write this? Hey, I’m a marketing guy, not a historian. Karl Marx 1875. Bummer. 😉 But that is the magic of capitalism, is it not, the energy we collectively spend to improve our own personal lot in life betters the lives of many. Rather like electricity if we are working diligently enough and generating lots of products and investments. Philippine manufacturing is hollow, narrow and shallow. The integration, linkages of the labor value added chain is more connected to the international division of labor. Philippine shipbuilding is assembly mainly. Nice characterization, hollow, narrow and shallow. Electronics, too, is assembly mainly. I appreciate all of the insights you bring in your comments. Who wrote this and when did he write this???? I don’t know, but I think he failed to imagine our great appetite for consumption. So probably 1800’s as well. Joe, Adam Smith put forth the ideas and principles that were the guiding hand that propelled economies all over the planet. His idea then of the factory/shop floor division of labor eventually led to the sectoral economic division of labor and later the international division of labor, all fueled by the labor value added chain. Please note the importance of the word chain. as the chain is strongest only as is its weakest link. Once again Smith knew then that economics was a two sided coin. Income = Expenditure (consumption is you like. Adam Smith laid the foundation for Marx ‘s writings. Absolutely fascinating. I was a math major in school and never studied economics. I particularly like “The labourer is rich or poor, is well or ill rewarded in proportion to the real, not to the nominal price of his labor.” That explains the relative happiness of the Philippines. “No society can surely be flourishing and happy, of which the far greater part of the members are poor and miserable.” That explains the grand underperformance of government. 1. True, food is a basic need. 2. But the notion that ore, metals and precious stones “add little to the wealth of the world” is, for want of a better word, loony. The instrument that allows one to encapsulate this message of lunacy is made of ore, metals, and precious stones; the network that allows one to distribute it rests on the same; the instrument that allows another to read it rest on the same. Firstly the author Adam Smith referred to precious metals and precious stones. The Japanese learned from Smith as they realized that with very limited natural resources in their country they moved quickly to an internal division of labor and a division of labor on the factory /shop floor. From 1850’s when the U.S. bombarded their port, they moved to industrialize, modernize their agriculture and by the turn of the 19th century destroyed the Russian Pacific fleet with iron hulled steam driven ships and by 1941 were bombing the U.S. Pacific fleet with Mitsubishi engine driven Zeros and bombers all carried on board aircraft carriers. FYI Edgar the idea that the Philippines was second to Japan in growth in 1950 is the product of delusional minds. We cannot be placed in the same bracket as an advanced industrial economy that Japan was even after the war. I just read an article written by the New Zealand ambassador to the Philippines, Reuben Levermore, at the Philstar opinion column wherein he said that agriculture is the number one industry of his country. When I emphasized in my first comment about.concentrating on coffee to compete in the world market, I did not mean exporting raw beans. We could send them all over the world packaged like those that the balikbayans bring home or even innovate other processes to make the taste even better. We also could manufacture world class chocolates or any other products from cacao that could compete with Hershey’s and Cadbury’s because the technology is already there and we have the primary resource – the land – to harness to produce milk and milk products we are still importing. No, I do not dream of agriculture becoming the number one industry like what they did in New Zealand. I just could not accept the fact that we are rich in natural resources but still languishes as a nation whose majority of the population is deeply mired in poverty due to policies headed in the wrong direction by politicians who are only concerned about their terms in office and what they could think of to make them rich. Agriculture had been looked down upon particularly by young educated people because rice and corn are the only products discussed as the only viable produce we could make money on, not on the products I mentioned above which governments past and present should have given a serious attention to, if not the top consideration in the business scheme of things. Absolutely agree, on all points. There are spots of light in the ag arena, but tremendous potential is overlooked, I think. Isn’t San Miguel Corp going gangbusters in the agribusiness? Another factor that is hurting job creation in the country is the widespread graft and the Philippine bureaucracy, particularly the audacious way they demand under-the-table ‘fees’ to for permits. These practices are spooking away local and foreign investors and the job-generating business they want to set-up. In the end, the constituents are the biggest losers here because they are the ones who lost the opportunity to make a living climb out of poverty. A few years ago my friend, a geologist by profession, was in Isabela province to survey for mineral deposits. They were at gunpoint by the local chief executive’s private army while the mayor demanded a spot cash of 2 million for their survey permit. They said they didn’t have the money and would return as soon as they got it. They never went back, probably never will unless the system changes. One way in which we can solve this problem is by encouraging the masses to demand jobs from the politicos in the next election. They shouldn’t settle for meager hundred peso bills for their votes, but instead demand ways to make a decent living. We should change the voter’s mindset from short-term to long-term because I believe job-creation is one of the best yardsticks for measuring the performance of voted government officials. Perhaps Secretary Jimenez should be given a new job, or a broader job than just tourism, that being internal social development via public service messages. Your idea on a military industrial complex is great, though I am not sure about its feasibility. Your Fair Employment Law is stupid. Who will determine what is fair? A bureaucrat and a judge? Bad. Its just a window for government to meddle in someone’s business. Anti-trust law, yes. And Bankruptcy Law, to minimize the risk of going flat broke in case of failure. On agriculture, our farms need more irrigation systems. The oligarchic control of the economy could only be broken by lifting the constitutional restriction on foreign investment. Well, unless we want to try the Park Chung Hee model of South Korea. Ahahaha, maybe fair employment is stupid, but what it really means is government and large businesses must hire solely on the basis of capability. It is the foundation for providing careers and the aspiration that motivates hard, smart work. If that is stupid, by all means, keep doing the existing system with favors and mediocrity plugging up the career channels. The courts would rule on cases and punishments should provide lavish penalties to the winning complainant so he can pay generous attorney fees. Military industrial complex, easy. You mean Filipinos can’t make drone airplanes with cameras in them? North Korea can. Absolutely, I am naive and ignorant, which is why I write this blog. My experience is with the American courts which are accessible and speedy, and the American business model, which mandates equal employment and hiring and promoting based on capability. I also agree it is up to a businessman to succeed or fail on his own terms, and many in the Philippines fail. I suppose the difference in the U.S. is civil rights organizations have done a marvelous job over the past 50 years to give all people the right to participate in the promise and prosperity enshrined in the Constitution, and companies have done a marvelous job at motivating their people to produce and provide good customer service. And the backroom to innovate. My subject is macro, the overall Philippine economy, and yours is micro, the company you run. I see across the land employees hanging around waiting for the clock to end, providing customer service begrudgingly, because there is nowhere to go and no reason to do it differently. I naively believe that sluggishness can be converted to productive energy. If it is not practical, at least it is a pleasant dream. For post industrial economies their challenges are far different from pre-industrial economies. Even their politics and culture are undergoing differing challenges. For two hundred years people have founded and built companies around Adam Smith’s briliant discovery that industrial work should be broken down into its simplest and most basic tasks. In the post industrial age we are now entering, corporations will be founded and built around the idea of reunifying those tasks into coherent business processes. “Business reegineering means putting aside much of the received wisdom of two hundred years of industrial management. Another thing the government should consider is encouraging/supporting technology startups (http://en.wikipedia.org/wiki/Startup_company). 1. Software. There are a lot of capable Filipino software engineers, home and abroad. It will be benificial to the Philippines if their expertise could be utilized. Philippine startup environment is on its infancy. We can start on business software. 2. Hardware. Actually software + hardware. Let’s start building drones. There was a joint project between Mapua and Phil. Navy, this is a good start but a more active government involvement could fast-track the development. Adrian, I agree that the Philippine startup environment is woefully lacking. I think the government is not the one to manage it. Government bureaucracy is inimical to innovation, creativity and ingenuity. Rather I would look to either venture capitalists, particularly those with a philanthropic inclination or some variation on crowdsourcing to get small businesses started. People have laid a lot of emphasis on Filipino resilience and with plenty of justification. But if I were to choose one single factor that distinguishes the Filipino it is ingenuity. I see it on a daily basis among the poor who make ingenious use of whatever is at hand to make their lives a little better. I consider ingenuity as the greatest resource in the Philippines. If it could only be encouraged and supported and all that power unleashed the results could be spectacular. Certainly IT and anything connected with computers, networking, gaming, would be one area of competence but I envision that Filipino ingenuity and creativity will produce ideas and industries that no one has the capacity to predict now. Maybe one area where some of that ingenuity can be applied initially is in developing ways to support the talented, creative and ingenious Filipinos who have so much to offer. I mentioned venture capitalists and crowdsourcing but I’m sure that there are better ideas out there just waiting for support. I very much agree with your assessment. Filipinos make the most of everything, not always good but a nonetheless a good trait. I hope the education executives (DepEd / TESDA) have already planned this out. I wonder why doesn’t the government make a research / feasible study on the incentives and protection / security being offered by China, Thailand and Malaysia to foreign investments / investors. PNoy and his cabinet members have to know why these countries get / achieve their economic targets, success in their economic policies, growth and development and betterment of the lives of their citizens. Make them role models for making Philippines attain its desired economic progress. Whatever is applicable to the Philippines, make it happen for the country. So noted. “Best practices” at securing investor confidence. Good idea, good leads.